The Exeter Eagles, heading into the final leg of the season, squared off with Owen J. Roberts in a non-league battle on Saturday evening. The prime-time matchup would mark the last of three games in three nights for Exeter. As the first quarter began, italmost felt like a game of Horse in the driveway, as both Owen J’s Matt Crider and Exeter’s Michal Menet traded buckets back and forth until the conclusion of the first period. When the first buzzer sounded, Crider held the upper hand, having scored 13 to Menet’s 10. However, Menet’s squad held a 16-15 lead where it mattered most. 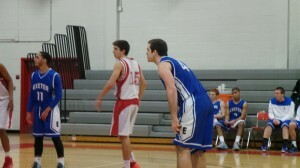 The second quarter went in favor of Exeter, who saw strong contributions from guard Luis Arndt. When the first half came to a conclusion, the Eagles held a 29-25 lead over the Wildcats. 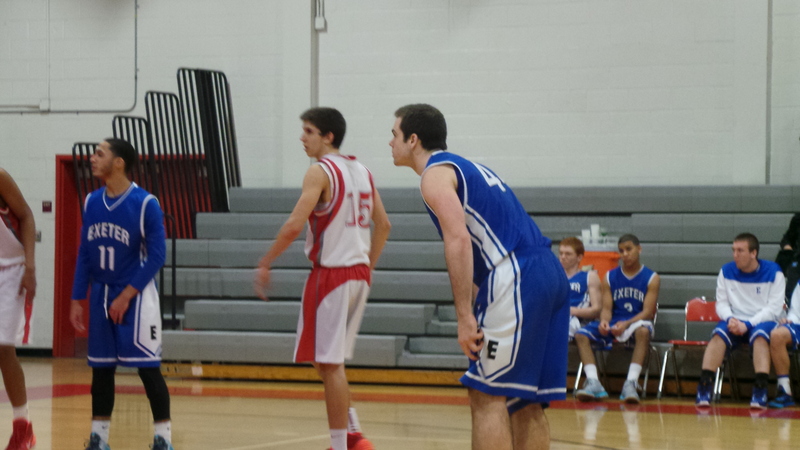 Exeter came out swinging early in the second half, forcing the Wildcats to take a timeout with the lead at 36-27. After trading baskets, the Eagles held a 39-29 lead with just about 3 minutes left in the third quarter. The Wildcats, trailing by 10, turned to their star Matt Crider to bring them back into the game. And bring them back, he did. The Wildcats closed the third quarter on a 7-0 run and found themselves trailing just 39-36 heading into the final frame. Led by Crider, as well as sophomore Cameron Reid, the Wildcats quickly grabbed a 41-40 lead over their visitors. However, the lead was short lived, as Exeter answered right back to take a 42-41 lead. The teams found themselves tied at 44 with just about 2:30 left to play. Ultimately, the two teams would head to overtime tied at 46-46. The Eagles surely did not plan on heading to overtime in their third game in three nights. Physically exhausted, with guards Taylor Trojanowski and Luis Arndt fouled out, the Eagles fought on. Exeter got back to doing what had helped them build a ten point second half lead, feed the ball to Michal Menet. Menet picked a good time to make his first foul shot of the night, as his three point play put the Eagles up 51-49 with 46.9 seconds remaining in overtime. After a missed shot was rebounded by a diving Daniel Garcia Jr., the Wildcats committed their 10th team foul, putting Garcia on the line for a pair of free throws with just 29.3 remaining. Garcia knocked down both shots and put the Eagles up 53-49. After Exeter forward Drew Churchill converted 1-of-2 at the line, the Eagles were left clinging to 54-49 lead with 15 seconds left in OT. Shortly after getting across midcourt, Matt Crider lofted a 28 foot 3-pointer which found the bottom of the basket, cutting the lead to 54-52 with 6 seconds to go. The Wildcats were forced to foul Michal Menet with 4.1 to go. Menet sank the front end of the double bonus to give the Eagles a 55-52 lead, but failed to convert on the second shot. The rebound, however, fell into the hands of Garcia, who also was fouled. After Garcia made 1-of-2, the Eagles had all but clinched the win at 56-52. Leading a trio of Eagles in double-figures was sophomore forward Michal Menet, who finished with a career-high 24 points. Both Luis Arndt and Daniel Garcia each added 10 for Exeter. Matt Crider led the Wildcats with a game-high 30 points. The Eagles, who moved to 11-6 on the season, will next be in action against first place Wilson on Tuesday.